Sixteen months we’ve lived here, nearly a year and a half. We’ve acclimatised in some ways, and are still figuring it out in others. I meant to write an update on our one-year anniversary, but it didn’t feel right yet. I’ll answer some of the questions I get a lot… and you can add any others in the comments below. So, are you fluent now? Ha, no. I can order food, sort out problems with a delivery person, ask questions in a shop, have a short conversation with my neighbours, and give directions. Conversations longer than ten minutes means I am struggling, and I still flounder around trying to respond. I understand much more than I can respond to right now, which is the normal progression of learning another language. Is it hard? No, not really. It takes constant practice and work, and a willingness to learn. There are many things about German that are similar to English. 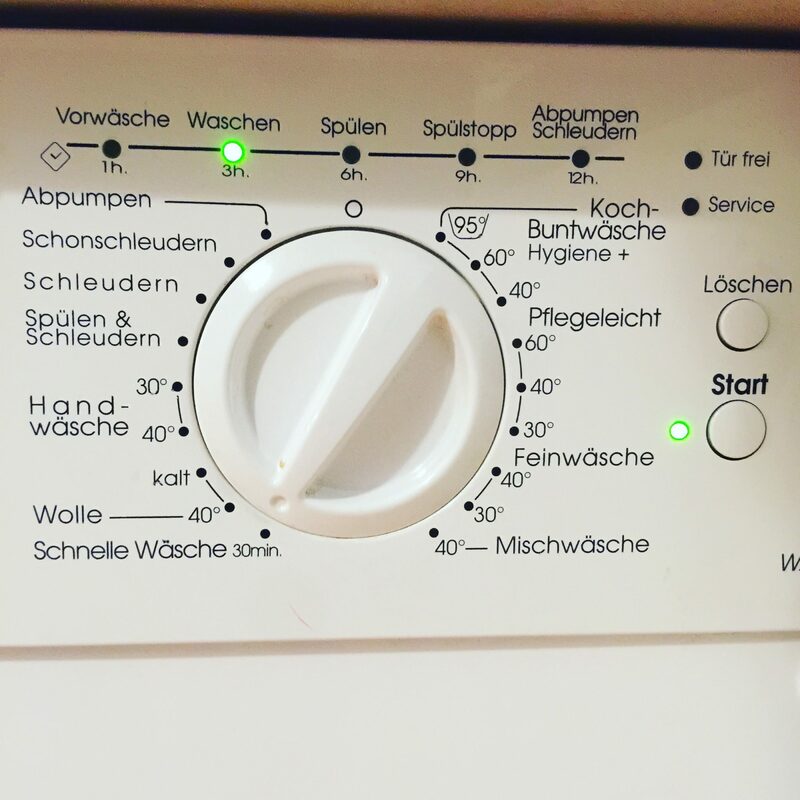 Obviously being in Germany makes it much easier, because I’m hearing and using it all the time. Probably the biggest difference now, to say, a year ago, is my accent is better and people are willing to speak to me longer in German. I’m in no way coming across as a local, but I think I sound more competent. My son, on the other hand, is much more fluent. Just the other week he ran up to some kids in a museum play area and spent 20 minutes playing in German. His German reading is great, possibly ahead of his English reading. He has some good friends who don’t speak much English at all, which is a real step forward as previously his friends were all English native speakers. Doing his homework with him has been like another German class for me, as he’s working on a lot of grammar things I haven’t learned yet in my classes. Tellingly, he only knows the names for nouns and verbs in German right now. My favourite things are the words he only says in German: ‘mittel’ for middle, ‘milch’ for milk. Even in the middle of English sentences. The private language classes that were part of our relocation package from my husband’s company are ending soon, and I’ll be starting some online courses on my own. Chicken hanging out with some eggs at the weekly market in Mainz. And do you like the food now? The one thing I mentioned at the six month mark that was not my favourite was the food here. The thing with living in a smaller town is the lack of dining out options. 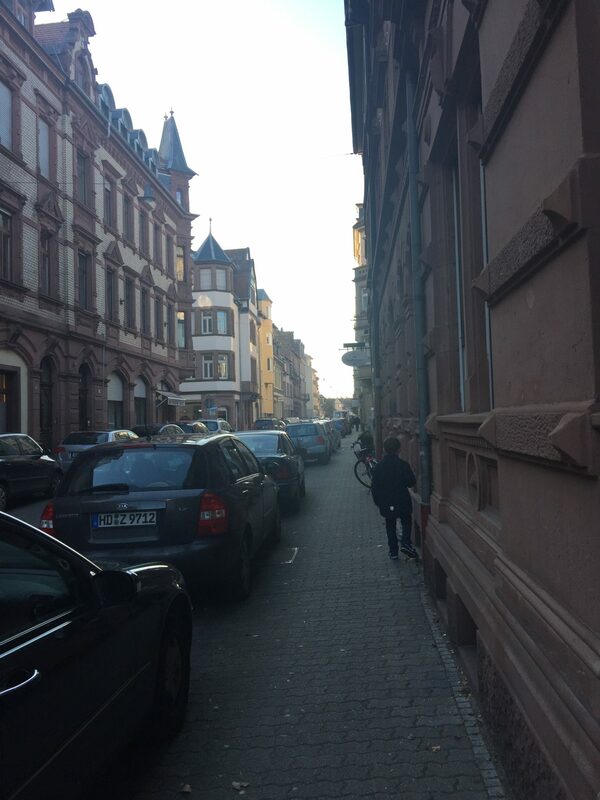 Heidelberg is lovely in so many ways, but the restaurant scene is not all that diverse. There are a few nice traditional German places with Flammkuchen, Schnitzel, and Käsespätzle, a couple decent places to get a burger, some fancier places for a celebratory meal – but outside that, well, it’s not great. That’s been good financially, as it means we’re not eating out constantly, but sometimes I want to have takeout that isn’t pizza. Finding diverse ingredients is a bit of challenge too. Your average German grocery store in our town is great for cheese, sliced meats, and every kind of preserved vegetable in a jar. Kale? No. Broccolini? No. Fresh coriander? Sometimes. Salsa? One kind. I’m not trying to recreate the cuisine of the old country, but it was a struggle initially recalibrating my usual go-to recipes when any kind of Mexican ingredient requires special ordering online, and all the cuts of meat are not only called something different, but are not the same cuts at all. I do still find it challenging that you can’t buy a package of chicken thighs (quarters only!). Obviously moving from a coastal city to somewhere practically smack in the middle of mainland Europe is a bit of an adjustment too, as I was used to eating much more seafood and fish than I do now. The cutest shop in Heidelberg – also where I get more unusual spices. So I subscribed to a bunch of German recipe sites, bought food magazines, and learned to make some more local recipes. Pork is everything in this region, which is good because we all like it. We’re right in the middle of lots of farms here, so we can buy straight from them farmers through their shops or their excellent vending machines. Compared to Canada, the grocery prices here are incredibly low. I am buying locally, and in some cases bio (organic) as well, and it’s a third less than I would have paid in Vancouver. My love for German cakes is never ending, of course. I have always loved a good cream-based cake, and that’s a popular format here. Your average German cake tastes about half as sweet as any North American equivalent, and it is so perfect. I feel like I’m tasting the cream and fruit instead just SUGAR. Ah, this is a tough one. I have a few good friends, mostly other parents from my son’s bilingual school and a friend of a friend. But I am pretty lonely. I knew this was coming – when we moved to London it took a few years before we found our people. But knowing it conceptually and dealing with the reality is two different wurst entirely. I am grateful for the community of English-speaking German people on Twitter who are always around for a good chat. This is one of the reasons I am so keen to get my German up to speed, I really want to be able to meet people here and take classes and all that. As we’re here long term, the expat community are not really my speed. They are much more rooted in their home country and talk a lot about when they go back ‘home’, and don’t seem to settle down here much. It’s understandable, they are often only here for two or three years. But we’re just not on the same page at all. Our neighbours have made a big difference too. We have been so incredibly lucky in our housing situation. Not only did we land in a spectacular neighbourhood just a short walk from the river and one of the best playgrounds in the city, but our flat is huge and super affordable. This did not guarantee good neighbours, and I have heard some horror stories – from both Germans and non-Germans. Both our upstairs and downstairs neighbours are lovely older folks who routinely invite us over for a glass of wine or tea, and they are the sweetest. I genuinely love chatting with them, even if it stretches my German skills to the limit. I know I will get there and make friends eventually, I just have to hang in there and keep working on my language skills. Looks like France, but nope – it’s southern Germany. This is a hard one, because the longer I live here the more layers I find to this country. From the outside looking in, we tend to think things or foods or people are ‘German’, but in reality, this is a very fractured and very young nation. The regions have identities that are so strong, internally they can override national identity easily. Bavaria, for instance, was a kingdom unto itself for hundreds of years before there was a Germany, and they have their own Bavarian language, which is technically a German dialect but… yeah. This is not even taking into account the more recent split of West and East Germany, which also carries with it massive differences in culture and behaviour. So, do I like Germany? Yes, I really do, but I only know my little south-western corner of it, living in a mid-sized university town. I don’t live in the Bavarian heartland of Munich, nor am I up north in complicated and cool Berlin. It’s a massive country with so many fascinating distinct identities within it, I feel saying something like ‘I don’t care for German food’ is doing an incredible disservice to this place. We are starting to explore further and further afield here, and we’re enjoying it so much. There are little things I love, like the way loads of people bring beautiful wicker baskets to do their shopping in – not just at the weekly markets but also in the grocery store, the corners of farmers’ fields dedicated to pick your own flowers, the prevalence of farm-side vending machines for everything from fruit and vegetables to jam and milk, and the fact that I see 75-year-olds cycling around with their newspaper clamped on their rear rack, a beret on their head, and a pipe in their mouth. Literally, there’s a guy in the neighbourhood who does this. Tell me, what do you want to know about living here? 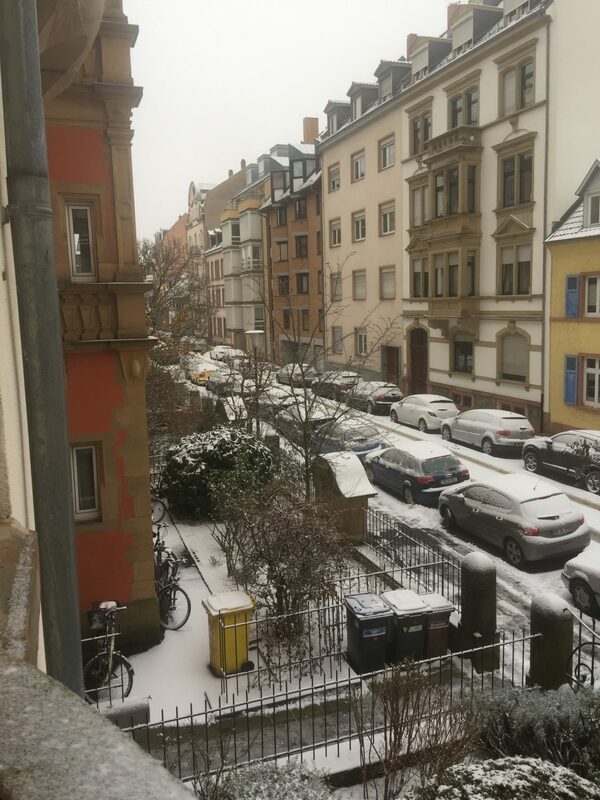 PS – I wrote about how we’ve changed since moving to Germany, and if you’re moving abroad, there are a few things you can do to hold on to your sanity. A sentinel watches out over the countryside from Burg Hohenzollern. The Hohenzollern family has a long and illustrious past in Prussia, so it might cause some confusion to find their ancestral seat down south in Baden-Württemberg. Prussia was one of their more famous holdings, but the family originated in Swabia (which is partially contained in the current state of Baden-Württemberg) near the site of this castle. The current castle is the third to be built on the Berg Hohenzollern, and it’s more of a memorial to the might of the Hohenzollern family than a home or even a fortress. When it was built in the mid-19th century, there were upheavals all through Baden, Bavaria, and the Palatinate as the many smaller states made their shuddering way into Bismarck’s German Empire. Burg Hohenzollern version three came to be right in the middle of this, and I’m sure the giant idealized castle on a hill was a bit of a heavy-handed exercise in Making A Point. They don’t get into it on the tour, however, probably because the castle is privately owned by the Hohenzollern family. Interestingly, neither of the previous versions of the castle were destroyed during the Thirty Years War, which ravaged so much of this end of Germany. The medieval castle built in the 11th century withstood a year of siege by the collected armies of the Swabian Free Imperial Cities, and a junior Hohenzollern brother, before it was completely destroyed in 1423. The second one was constructed about 100 years later, and it flipped around between the Habsburgs and the French before everyone seemed to lose interest in it, and it was abandoned from 1798 onwards. This is all detailed in a mural in one of the hallways inside the current castle. When you come to visit Burg Hohenzollern, you can see it from kilometres away, standing proud and exceptionally castle shaped on top of its little mountain. It does look like a very large child has dropped it from the sky. You can approach the castle on foot from the parking lots, or by taking a minibus up for about 3 Euros. If you’re going as a family, definitely take the minibus as the walk up is an energetic hill climb, and there will be walking once you’re up there. You buy your tickets at the bottom, and they are checked as you enter the castle. You will want to arrange your places on an English-language tour when you check in at the top castle gate – it is the only way to see the interior rooms. This is a common feature of castles in the region, by the way. The tours are fairly quick, about 45 minutes or so, but buggies are not allowed inside. On the tour, the kids get to wear ‘royal robes’ which feature heavily in the family portraits on the walls, so my son was pretty chuffed about that. If you have a squirmy one under 5 years old, the tour may not be worth it. It’s worth noting you can’t take photos of any kind inside during the tour. There’s an outdoor cafe kiosk serving pommes frites, snacks, coffee, hot chocolate, ice cream, and that sort of thing in the courtyard. There are lots of tables, and it’s quite beautiful really, so if you need to kill time while someone else does the tour, it’s not much of a hardship. There’s a white tablecloth restaurant inside, but if you’re wrestling small people, this is probably not your deal either. The winding walk up to the castle courtyard, and the exterior walks, are beautiful and afford pretty astounding views out over the countryside. The walls along the edge are not very high in places, however, and there are not the railings you may be used to, so it’s best to keep firm hold of little hands. The dramatic photos of the castle from a distance are taken from a specific view point about a half an hour drive away. This sounds like an extra thing that is too much of a pain with kids in tow, but to be honest, there’s a good 20-minute walk up a trail before you get there, and it was a really good break from all the driving in the car. The viewpoint itself is amazing, even if you don’t take many photos, but it is very unofficial, and it’s literally a rocky outcropping with a steep drop-off. There is no railing, and it’s a bit intense. If you have a under-five that likes to dash away from you, this is best viewed back from the edge with firm hand-holding. My active seven year old was fine, and there are a few benches. We were there firmly in the off-season, and it was FREEZING, and there were three guys having beers sitting on the rocks, two other photographers fussing over their shots, and us. I can imagine this spot gets very very busy in the summer. To get there, park in the lot next to the Zollenstieghof, and take the white gravel path that goes around the back of the hotel. I found this place thanks to Be My Travel Muse. I think it’s really worth finding this spot, the drive there is through several picturesque little German towns and the walk is lovely. The view is truly breathtaking, coming out of the trees and seeing this spread out before you. While driving home, we decided to find somewhere other than a fast food place, and a rapid translation of German Yelp netted us this local gem in Balingen. Ochsen is a very local place. Like ten tables, and at least three of them seem to know each other in that neighbours running into each other at the grocery store kind of way. The single waiter was very friendly, and we had a selection of Swabian dishes that were wonderful. Pork and beef in paprika sauce, käsespätzle (noodles with cheese sauce), and excellent pommes frites. There’s a small kids menu too. You’re going to need your Google Translate ready to go if you can’t read German – there are no English menus and we had all our conversations with the waiter in (simple) German. It’s also cash only, but there’s a ATM just up the road. Walk off your meal in the beautiful village of Balingen, with half-timbered houses all over the place. This is not on any tourist trail, so enjoy this little corner of the proper Swabian countryside. We’ve been living in Germany for six months now, and it feels like we’re finding our feet. Our son has settled into school well, and the German words are flowing a bit more often (as are his corrections to our German!). Letters from the bank are less confusing, and I’m pretty good when faced with a wall of German signage. It’s very isolating, walking around and not being able to exchange small talk with the person next to you in any way. I can make my way through most cashier interactions – asking for a bag, understanding how much things are (just about), and saying have a nice day and goodbye. If I have time to plan ahead, I will work out what I need to say but I get flustered very easily. It’s ridiculous, everyone is incredibly patient and friendly about my halting German. More than friendly, nearly everyone seems thrilled I want to learn. Of course, they also want to practice their English, so it can be a battle to get someone to keep speaking German with you. As the weather slowly warms up, I’ve noticed the tourists starting to appear. Our little city has nearly 12 million tourists come through every year, so by next month I expect to see many more. We spend most of our time outside the Altstadt where most people go, but it makes me smile seeing people standing on our bridge and taking photos. Even when they back into the bike lane. I swore in German the other day when it happened, so that’s a step forward I suppose! The food thing has been the hardest adjustment. German food is very regional, so what you hear about as ‘German’ in other countries is often only a very small window into what’s available. 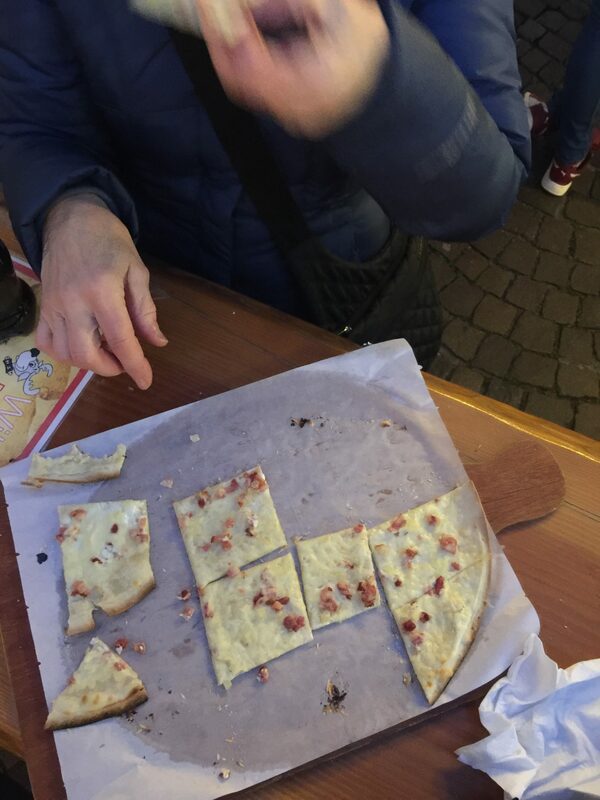 Where we live, there is a lot of Flammkuchen, which you can get in France in the Alsace and Lorraine region as tarte flambé. It’s a kind of flatbread, baked in a wood-fired oven, with creme fraiche, lardons (bacon), and leeks or onions. It can be very rich, it’s not something I eat regularly. There are the sausages, of course, and there seems to be quite a bit of weißwurst around, the Bavarian white sausage. Frankfurt has a vinegary green sauce that they apparently put on everything, I quite like it really. Swabia has its own distinct cuisine, but they are a bit east of us, so I don’t think I’ve had proper Swabian food yet. 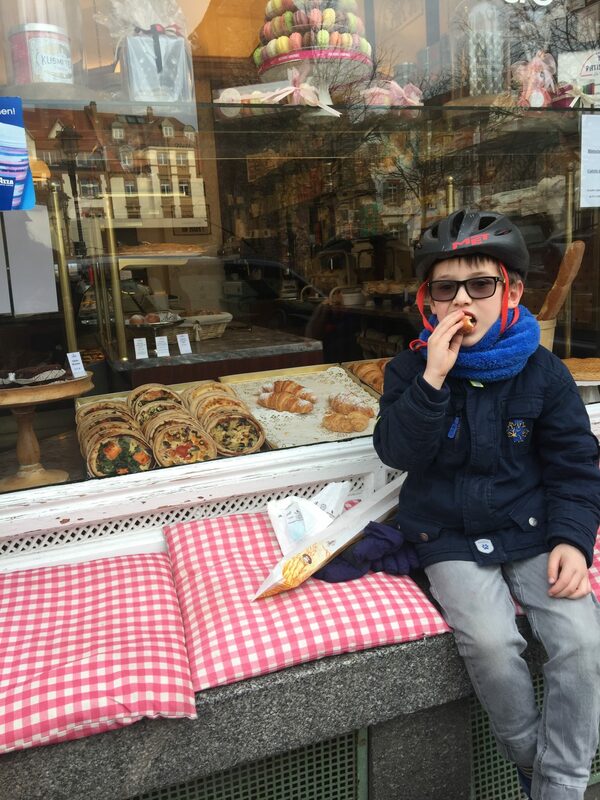 Because we are so close to France, we get quite a few very good patisseries and cheese shops, one of which he asks to stop at every day on our bike ride home from school. He and I often have a dinner that mainly involves half a baguette each, smeared with good cultured French butter and sea salt, when my husband is away. I end up making a sort of hybrid meal of things I’ve learned here, with what’s available, from recipes I know from living in Canada and the UK. Strange things are difficult to find: broccoli is often sitting yellow on the shelf, and if it is green, it turns yellow within a day when I get it home. The ubiquitous-in-Vancouver kale is not often in the shops either. Cabbage, of course, in many, many varieties, is everywhere and very fresh. I’ve adjusted to using Savoy cabbage in place of kale. We’re on the edge of a wonderful wine region, so I take every opportunity to try out the local product. My son gets a hot lunch served at school, and occasionally I hear reports of potato dumplings or pancakes for lunch with ham and cheese in them. I’m pretty sure he’s had more of the local cuisine than we have. I wonder sometimes, will he remember Canada if we stay here until he is older? I was keen for him to experience Canada when we moved from London back to Vancouver. We don’t know when we will go back, but I can easily imagine him turning 10 before we do so. Seven through ten are such formative years, how funny to think he will experience them here. As I watch distressing things happening in the news, I think it can only be a good thing to feel yourself a citizen of the world, and meet as many different people as you can when you’re young. I spotted photos of the library at the Wiblingen Monastery on Pinterest, often included in Libraries to See Before You Die lists. When I looked it up on a map, it was only a two-hour drive away, so we checked the off-season schedule and drove over at the weekend. The Wiblingen Monastery was founded in 1093, and was the home of Benedictine monks from the Black Forest and surrounding area. In 1714, they undertook a massive renovation, which is where we get all the spectacular and over the top Baroque details. The library itself was incredible. Unheated, in the winter it is a bit freezing. While we were there, a couple was having photos done and the woman in the strapless dress must have been losing feeling in her arms. There is a museum in the Abbey as well, with audio guides in English. There are plenty of beautiful illustrated maps of the area, huge wax seals, and other ephemera. We found this fascinating, but we also live nearby, so it may not be as exciting if you’re visiting from afar – though if you’re in Ulm, it’s well worth a visit. If you’re visiting in the off-season, check their site to see what’s open and when. The Ulm Minster is impressive, to say the least. A classic extended building project, the foundation stone for the church was laid in 1377, but the final building wasn’t finished until 1890. As with many building projects in southern Germany, the Thirty Years War derailed everything. Incredibly, the Minster was not damaged in WWII, though most of the medieval town was destroyed. A totally unplanned stop on our day trip was the Museum dur Brotkultur, which translates literally to the Museum of Bread. This sounds hilarious initially, but the role of bread through history is quite central. There are three floors of bread-related history displays, and they provide English-language audio guides as well as a children’s audio guide, which was a big hit. It’s a short walk from the Ulm Minster, and I really recommend it. Unfortunately it was freezing out, and we didn’t get a chance to find anywhere to eat in town, so I have no suggestions on restaurants I’m afraid! There are the usual little backerei around where you can get soft brezel and sandwiches of course. A good bowl of ramen is a three-part experience for me: a filing and satisfying meal, an emotional restorative, and a pork-scented steam facial. I have been lucky enough to live in Vancouver, a city with a ramen district housing at least ten different tiny restaurants serving incredible ramen, as well as a scattering of other shops throughout the city. The proximity to Japan and Vancouver’s large Asian population keeps these ramen shops up to date and authentic. Well, let’s use authentic loosely, as ramen has been a bit of a mash-up since the beginning. Now that I live in a small town in Germany, a good bowl of fresh ramen is only going to happen if I make it. So, of course, I had to try. I took as inspiration my favourite Vancouver ramen: the Tori Shio at Benkei Noodle Shop. 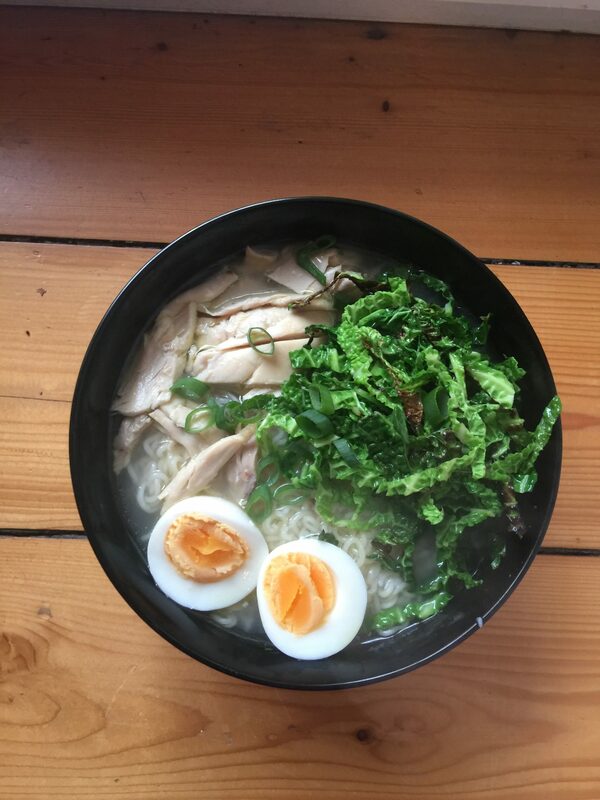 This is pretty lightweight when it comes to ramen: a chicken broth as opposed to fatty pork, lean slices of chicken breast, spinach, a smattering of corn, and the noodles. But it’s my favourite. So my at-home version is chicken-based too, and uses ingredients you can find in most big grocery stores. I often make dinners with how I’ll use the leftovers in the back of my mind, and generally this means they’re going into my ramen. Roasted root vegetables, brussel sprouts, fried onions – these are all good. This is a favourite post-roast chicken meal. 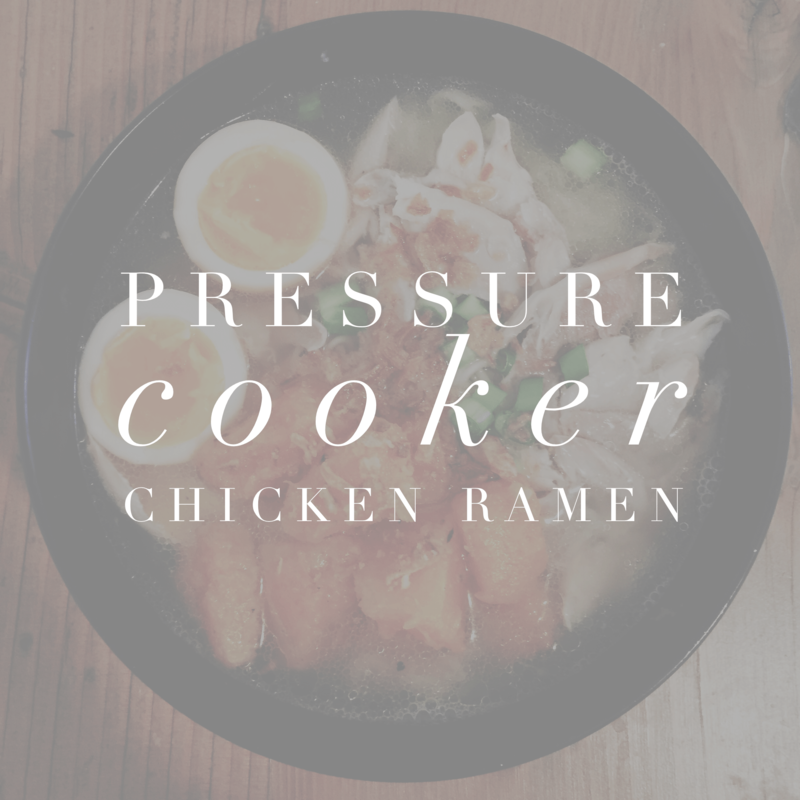 My [amazon_link id=”B00FLYWNYQ” target=”_blank” ]Instant Pot[/amazon_link] is my best friend here – it makes generating both the broth and the ramen-style soft-boiled egg super quick. Put chicken carcass, water, ginger, garlic, and mirin in your pressure cooker, set for 90 minutes on high pressure. Use quick release, open your pressure cooker and strain out the bones and other bits. Jar up your broth and refrigerate, or set aside. Put chicken carcass, water, ginger, garlic, and mirin in a large pot, and put on medium high heat, bring to a boil. Reduce to a simmer, and let it go for as long as possible – four hours is ideal. If using a slow cooker, set to 8 hours on low. Strain and bottle up, refrigerate or set side to use immediately. Bring the ramen broth to a boil, and then add the noodles, following cooking directions. Pull the noodles out with tongs into big bowls, then divide the broth between the bowls. Add your toppings, slice ramen egg in half before placing on top of noodles if using. Recipe note: I don’t add salt to my broth as I’m using a carcass from a roast chicken I’ve made myself which I salt generously. I like adding salt to my ramen right before serving so I can really taste it. Feel free to add salt to the process wherever you want though.